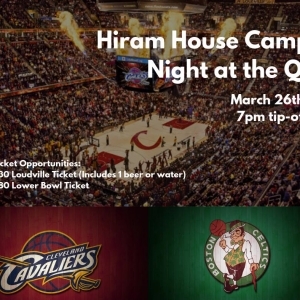 Cleveland Southeast, OH Hulafrog | Hiram House Night at the Q! Hiram House Night at the Q! Support Hiram House as the Cleveland Cavaliers take on the Boston Celtics. Join your fellow campers or meet new friends as you watch the game, AND all campers will be given the opportunity to get on the court for the HIGH-FIVE tunnel with the players. *A portion of all ticket proceeds will go toward the Hiram House Campership Fund.